As at April2017, there were 226 companies listed on the Euronext Access market of Paris,13 companies listed on the Euronext Access market of Brussels and 10 companies listed on the Euronext Access market of Lisbon. These markets boast a broad industry sector diversification based on Industry Classification Benchmark (ICB) classification. Issuers tend to be relatively small operations.. Liquidity is in line with market capitalization and free float level. The Euronext Access markets are less liquid than 'traditional' markets. The Euronext Access markets target local companies that would like to finance the next phase of their development and benefit from the reputation bestowed on public companies, without having to satisfy all the requirements associated with a listing on the regulated markets. They are, however, entry level markets and only represent the first step in a company’s development. Once a company has grown sufficiently it is encouraged to consider a transfer to Euronext Growth and later to an Euronext regulated market. Within the Euronext Access market; a new compartment called Euronext Access+ was created and designed for both start-ups and SMEs. Euronext Access+ helps them make a smooth transition to the market and adapt to its operations. This new compartment acts as a springboard to other Euronext markets. Companies admitted to trading on Euronext Access+ are given additional assistance and their shares benefit from greater visibility. Euronext Access+ will have its own listing criteria. 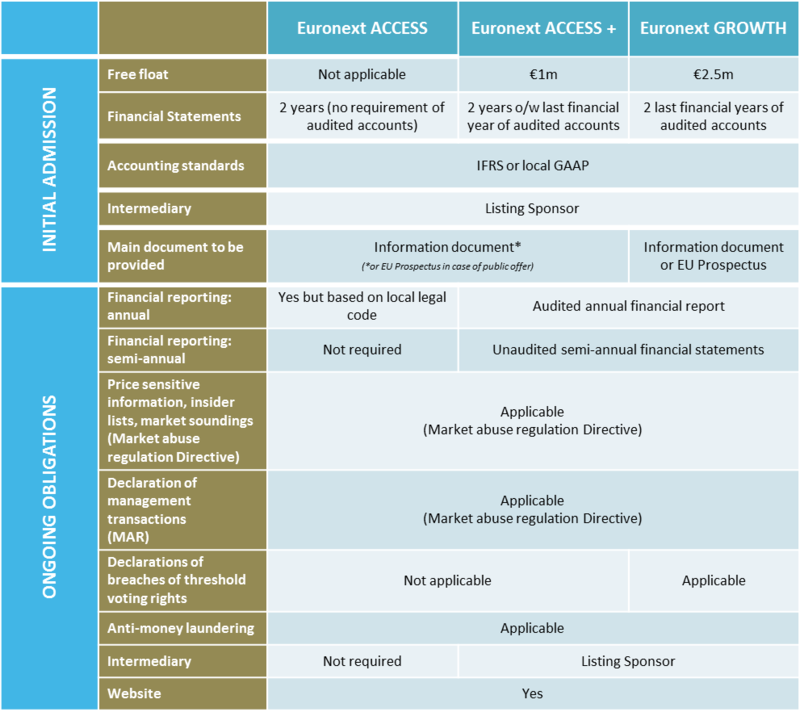 Below are the criteria to be listed on the Euronext Access markets (Euronext Access and Euronext Access+) versus on Euronext Growth. Besides, there is no obligation to appoint a listing sponsor on a permanent basis after the admission (except on Euronext Access+). All transactions on the Euronext Access markets are cash settled, i.e. the buyer must pay the funds and the seller must deliver the equities once an order has been executed. Trading and data dissemination are handled by Euronext Brussels, Euronext Lisbon and Euronext Paris respectively. Euronext Brussels, Euronext Lisbon and Euronext Paris may suspend the trading of a security in the interest of the market or on the issuer’s demand. For a comprehensive breakdown of fees relating to an IPO on the Euronext Access markets consult the relevant fee book or contact one of our team members.